Today's random set is 3420 Championship Challenge II, released in 2002. It's one of 43 Sports sets produced that year. It contains 388 pieces and 12 minifigs, and its retail price was US$50/£39.99. It's owned by 730 Brickset members. If you want to add it to your collection you might find it for sale at BrickLink or eBay. A great set for a town layout if you have the real estate. A good mix of kid-appeal, clever construction and hands-on play. Only let down by being from the era of crumbling white stickers. I have the 2K version of this. I got it from my cousin, when he got "older", or "grew out of Lego". And let me tell you he got everything, the stands, camera, two team busses, lights and everything. Man, I was happy that day. I don't see much difference between this one and the older model. 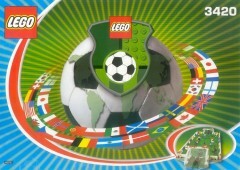 There's got to be better images of the boxes for these soccer sets, right? What's up with the giant logo and the tiny image of what is clearly a large set for the instructions? I had fun with the smaller version of this set, the 3-v-3 Shootout (3421), but... on the whole, I can't say I was overly enthralled by Lego's football range. I can see the appeal of them, I will readily admit, but it's not an appeal that draws me, personally. I have the year 2000 version of this. It was a special version that came with an extra team of Orange torso/White pants minifigs to represent the Dutch Soccer team. Euro 2000 was hosted in Netherlands/Belgium at the time. I think they remade this set with different goal designs because the goals got loose very easily, also the 2002 World cup of course. LEGO should return with the sports theme. There are two main differences between this one and #3409-1, and they both involve players' range of motion. In the remake, the goalie is controlled by a unique assembly (used only in the 2002 soccer sets plus #7257-1, though the smaller piece also appears in #7259-1) which allows him to move up and down, whereas only horizontal motion was possible in the original due to the use of more common parts. In addition, two of the players in the remake have field bases with sliders that allow them to move about two inches side to side. @TeriXeri The goal design is also improved in this version.